Hummus is a dip or spread which originated in Egypt and is made of Chickpeas (garbanzo beans) and sesame paste (tahini). It is high in fiber and protein and happens to be one of my favorite snacks. I enjoy it with brown rice crackers and various veggies but historically it was served with flatbread or pita. It is also great as a spread on a turkey or veggie wrap and a perfect appetizer for guests. I do buy hummus, especially during busier seasons of life, but prefer to make my own because I can control the freshness of the ingredients and the cost. You can add roasted red peppers, roasted garlic, chipotles, curry or just some extra lemon juice. 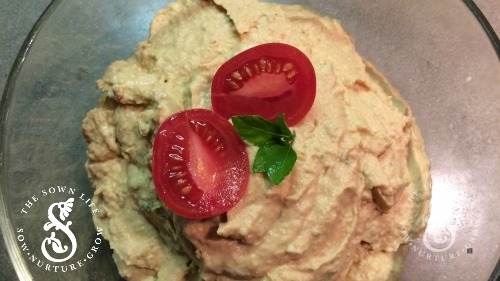 Hummus is an amazing source of fiber, a subject I blogged about this week. Fiber is one of the vital components of a healthy meal and hummus is such a delicious way to get it in! It is definitely one of my favorites, enjoy it any way you like! 1. Place beans, tahini, garlic, lemon juice, sundried tomatoes, basil and salt in food processor or blender. 2. Pulse for a few seconds then start slowly streaming olive oil in as needed to make a smooth, creamy hummus. That’s it! Very simple. Try some different variations on your own and be creative!! A little drizzle of olive oil and some chopped herbs or lemon zest can really jazz it up. Enjoy! 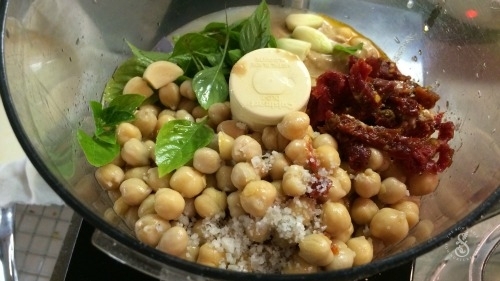 Place beans, tahini, garlic, lemon juice, sundried tomatoes, basil and salt in food processor or blender. Pulse for a few seconds then start slowly streaming olive oil in as needed to make a smooth, creamy hummus.